Artis Altai, located in Mongolia in the heart of the Gobi Desert, is an artisan’s workshop that provides employment opportunities for women who have little or no income. Artis Altai combines traditional felt making expertise, used since the time of Genghis Khan, with innovative contemporary craft designs. Every purchase contributes directly towards improving the living conditions of women and their families while offering hope, confidence and dignity through professional activity. Artis Altai is now a registered women's cooperative business. This bird house would make a delightful decoration hanging in any children's bedroom, playroom or even near some pot plants! The bird house itself is 22cm high and 10cm diameter. Each piece is hand felted using pure Mongolian wool and quality non-toxic dyes. 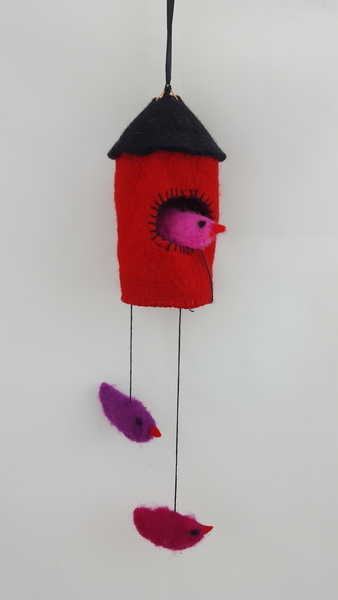 The little birds are attached on varying length cords. They can hang down or be placed inside the house.